We specialise in delivering fully managed office and warehouse refurbishment projects that are designed to provide you with a cost-effective means of maximising space and productivity in your existing office space. You don’t have to relocate to reap the benefits of a new office space, revitalising your existing workplace can attract new clients and a higher quality workforce, enhance morale and improve productivity. An office refurbishment company you can rely on. Refurbishing an office isn’t just about making it look better, it should be about improving the working environment of your staff so that their productivity improves and they enjoy coming to work. At Building Interiors, we start with a three-step process of discovery, design and construct to ensure we consider all the key aspects on an office refurb. Starting with the discovery phase we put together a full workspace strategy to ensure your company’s requirements are met. Looking at your employee’s wellbeing alongside business goals we create a plan to improve your office space delivering results. Considering our discovery phase including priorities we deliver a complete design for your office space. With an experienced design team who have worked on projects of sizes, whilst specialising in larger projects you can be assured that Building Interiors will create you a design which improves your organisation. The final phase of the project is the construction phase and to ensure you are confident in the Building Interiors solution, your project will have a dedicated project manager to ensure the office refurbishment runs smoothly and is done in the most efficient way possible. You will also get to meet each person involved in your project including the designer, project manager and construction team which allows you to have as much or as little input as you want throughout the whole process. 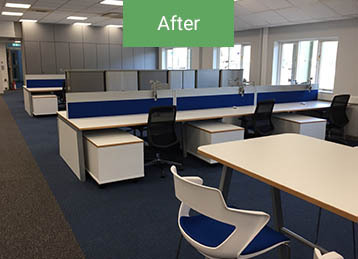 With over 10 years experience in the office refurbishment business we have perfected our method to ensure your business can continue to work with minimum disruption whilst the project is undertaken. Our service team and designers will take into account your suggestions and make recommendations based on the office layout and how your business works, to ensure that your office refurbishments make the working environment more productive and efficient. 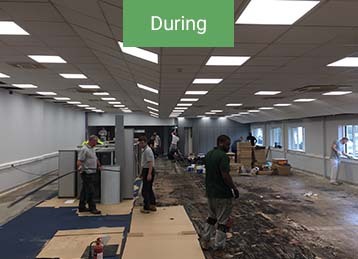 Once the project starts a dedicated project manager will be on hand to ensure the office refurbishment runs smoothly and is done in the most efficient way possible. As with any major office change there are disruptions but our team have learnt the best ways to minimise these which means a very limited impact on your business and staff. There are no hidden costs with Building Interiors. Our team ensures that your office is ready to work in on completion by always leaving the area clean and tidy, so your staff can come into work and enjoy their new workplace without the worry of unnecessary down time. To reduce the impact on your business we at Building Interiors offer out of normal office hours work. At Building Interiors we use a seven step process to fully understand your business, its goals and the needs of the employees within it. We pride ourselves on being honest and reliable and this seven-step process ensures you fully understand what is going on at any point of the project, until we deliver the final result. 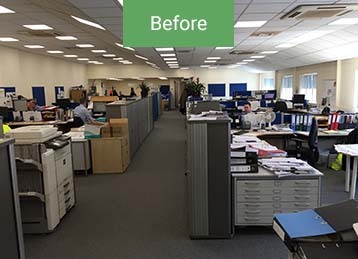 On behalf of all of us, I’d like to say a big thank you for all of your hard work in delivering the project office refurbishment at Dalton – on time and on budget! It looks fantastic and all of your efforts and commitment, including out of hours working, is greatly appreciated! Please pass on thanks to the rest of your teams that were also involved in the project.